Our apartment is on the same property of our villa. It is located on the 1st floor facing south and has a separate entrance. From the balcony terrace is a fantastic view of the Mediterranean in front of us. The apartment was built in June 2005, the 107 sqm apartment is part of a luxury villa (south facing) and is situated on the picturesque peninsula of Kas. Here you can enjoy the peace without giving up the lively Kas. From the spacious balcony terrace you have a romantic view of the Mediterranean sea, the Greek island of Meis and other island groups. The apartment was built to European standards and designed to the highest standards. 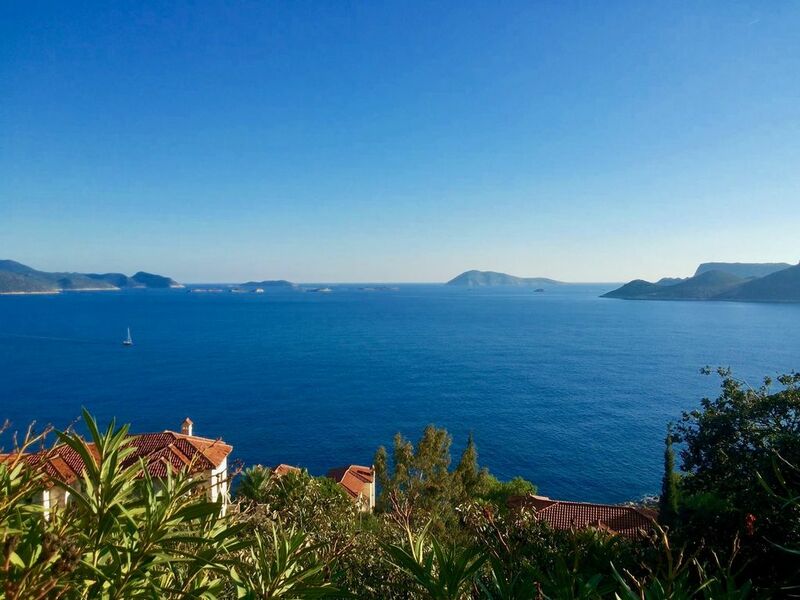 From the spacious balcony terrace on the first floor you have a romantic view of the Mediterranean, the Greek island of Meis and other archipelagos. Below the villa there are several swimming platforms which are within walking distance of 300m as the crow flies. The pool in the garden and the bath terrace are only available to our two apartments. Within Kas there is a shuttle service that runs every half hour to the peninsula. The driving time to the center is only a few minutes. Several beaches are nearby. Excursions and visits: For organized excursions can be found in Kas diverse offers. Various excursions by boat (visit of a sunken city, crossing to the Greek island of Meis, and much more). Excursions to Patara (birthplace Nickolaus), Saklikent (a huge rock formation with a river), Myra (beautiful rock tombs and a theater), Pamukale (with its limestone terraces) and much more are available. It is also possible to hike on one of the most beautiful and longest marked hiking trails in the world (520 km), the Lycian hiking trail. The best season for this is spring or autumn. If you are interested in self-organized excursions, there are many possibilities for this as well. For example, a day of swimming on the Patara beach. One of the most beautiful sandy beaches of Turkey (15 km long). Accessible with small coaches or with a rented car. The journey time is 45 minutes, but it's worth it. Costs included in the rental price and miscellaneous: The respective rental prices include the costs for gas for cooking, electricity, air conditioning and water. billed (Kwh - price currently 20 Euro-cents). The air conditioners are essentially only needed from July to August and January to February. With sensible use of the air conditioners (keep doors and windows closed, switch off air conditioners in the absence) 15 kWh per day are sufficient without additional costs. When renting a car, we can help you. With appropriate early information and availability, we receive cheaper rental rates for you. For example, a car, 1 week, 5 people with air conditioning for about 20 -50 EUR per day depending on the type of car. Our villa is located in a fantastic beautiful location. Rarely is such a situation to be found in the world. The view of the sea is indescribably beautiful. On our property grow oranges, lemons, bananas and many exotic plants.The splendor of the flowers are indescribably. The people are friendly and accommodating. Kas and the Lycian coast have preserved their originality until today. On the peninsula, we have the absolute peace without having to give up the living Kas. The Mediterranean is about 300 meters ahead of us and invites us to swim in its crystal-clear water again and again. The peninsula of Kas is the pearl of the entire Turkish coast. The bathroom floor and the shower are tiled with dark grey shiny tiles. The shower cabin is made of glass. The washstand is made of granite and it has embedded sinks. The toilet is a hanging element with a additional bidet function. With the air conditioning can also be heated. The pool and pool terrace is only available for our two apartments. The rooms have the following sizes: living room with open kitchen: 31 m², bedroom 1: 21 m², bedroom 2: 18 m², hallway: 4 m², bathroom: 7 m², terrace balcony: 24 m², the entrance to of the apartment: 12 m², laundry room: 20 m², pool: 7 m long and 3.5 m large, deck chairs, sun shades, and extra 30 m² sunny terrace. There are covers, pillows and towels for 4 people, dinnerware for 6 people and complete kitchen equipment, with pots and pens. Air conditioning, vacuum cleaner, washing machine, dryer and garden furniture (tables, chairs), as well as Satellite TV are available. There are 2 central Satellite connections: Astra and Türksat. Ulku ( the owner of the apartment, didn't get the opportunity to meet Michael he was in Germany ) was a perfect host very informative yet unobtrusive, she advised us about car hire, and various opportunities to visit different areas around Kas. She is an artist, a very talented lady. Due to the apartment being on the Penninsula we had a very refreshing breeze all through the apartment which meant we only used the air conditioning during the night in the bedroom.There are mosquito screens on all doors and windows. The villa/apartment is located on the roadside not at the bottom of the steep hills like some other accommodations which means you don't have a steep climb should you want to venture out . Having visited kas many times before, but always staying in the town we were a little unsure about staying on the peninsula, if you are concerned about this please don't be. The dolmus (small minibus) runs every 30 minutes past the apartment, quarter to and quarter past the hour, making access into town very easy. it is possible to walk we did it early morning one day ,it was over an hours walk, good if you want exercise but not practical in the July heat . The last dolmus leaves town they say midnight but we caught one 12.30pm one night 5 TL for two people. Taxis 25TL. We have just returned from a fantastic two week holiday at Apartment Panorama on the Kaş Peninsula (Çukurbağ Yarimadasi). Ülkü and Michael were fantastic hosts assisted by Yusuf who looked after the garden and pool. The view from the balcony and poolside were ‘to die for’. It was reassuring to know Michael was available to advise if needed: a wealth of information. From the outset he went out of his way to arrange whatever we required from an excursion to the Greek island of Meis (Kastellorizo ) and a Gulet boat tripfrom Üçağız where we sailed all day around the island of Kekova with our hosts. The apartment was very clean, well maintained and had everything needed to feel at home right down to the delivery of fresh bread each morning and chilled water refills when required. Nearby Kaş town itself is truly charming and full of character, friendly people and it has a wealth of restaurants. We alternated from eating in using the barbecue provided and trying different high quality restaurants in Kaş town. There are lots of activities to do when not lounging around the pool and we would recommend hiring a Gulet for the day (definitely our favourite) as well as visiting Patara beach and Saklikent Gorge. The holiday was very relaxing giving us an opportunity to recharge our batteries. Thank you Ülkü and Michael for allowing us to share the peace and tranquillity of your beautiful apartment. We look forward to returning to Apartment Panorama as soon as possible as we know that when you wake each morning to that stunning view from your bedroom, it never fails to take your breath away. We are a French family of four (2 teenagers) and have spent a week in the appartment in August 2013. We booked the appartment via internet. This is a sunny, bright and roomy appartment, impeccably clean and with all modern amenities. Also noticeable are the private outdoor spaces: a nice and large balcony runs all over the appartment, with a sofa and a dining table and a nice private pool stays a few steps below, all with an amazing view on the sea and the islands. We thus truly felt like being in an house rather than in an appartment. The neighborghood is very quiet (no disco or noisy bars). Nights are thus delicious, with only the sound of the sea. A shuttle bus service is available to get to the center of Kas and back, even at night and is very safe. Our teenagers (15 and 17) were thus happy to get a bit of Kas day and nightlife independently. Special thanks also to Ulku and Michael for their true kindness and useful tips. My wife and I spent a wonderful week relaxing at Apartment Panorama. As described, it is a beautiful two bedroom apartment with a lovely open plan living room/kitchen, all mod cons, and with intriguing original art throughout. The photos on the website do not do it justice, however, it is truly a piece of paradise. The outside of the apartment is beautiful, colourful and fragrant flowers, exotic plants and trees, and a lovely little pool. The highlight is the balcony and its stunning views across the Mediterranean to the Greek island of Meis. We spent many happy hours sat here to eat, read or just relax, and found it increasingly hard to leave the apartment as the week wore on! Ulku and Michael were fantastic hosts, providing us with all the information we needed, organising the delivery of fresh bread each morning, and allowing us to enjoy the tranquility of their beautiful apartment. We hope to come back and stay with them again, and have already recommended it to our friends and family. For us, Kas was the perfect destination, a pretty little harbour town full of excellent restaurants, with beautiful beeches and amazing archaeological sites in immediate surrounding area. Hire a car and there is no end to the fun that can be had! We expected a nice apartment after seeing the pictures. In reality it is more than nice both inside and out. The interior finish is done to a high standard and everything we thought we might want to use was there, and more, including screens in doors and windows. The balcony is great and the view superb. Everything was clean. We were received by Yusuf first and then welcomed by the owners. They were very friendly, provided information and offered assistance if needed. I've bragged about this apartment to friends and relatives. The apartment is on a nice, quiet peninsula close to Kas, which is a town with an agreeable atmosphere to it. Nice to wander in and around and sit to eat or drink (we went to Sultan, Sardunya an Lola to eat). We drove to Myra, Kalkan, Cukurbag and Phellos. On the way back to the Dalaman airport we stopped in Fethye. On one of the southern extremities of Turkey, there is a small paradise, an idyllic fishermen town with 8000 inhabitants. Kas has a uniquely beautiful nature at the Mediterranean Sea, and is surrounded by the green Taurus Mountains. The town has a central location. There are 2 hours to Dalaman airport and 3 hours to Antalya. The arts street of Antalya is a unique experience. Many artists inhabit the town and change the image of the street. On the narrow streets paved with header bricks, there are many comfortable restaurants, small stores and nice houses. The shopping facilities are good. Each Friday, a big market takes place. Silver, Pashmina towels and leather articles are very convenient here. There are a few small guest houses and only a few big hotels. Kas is a small county town, where the construction of big, intrusive buildings is not allowed. The peninsula is a part of the town Kas.